A Lazy Housewife’s Guide to Meals#1 – Random. Structured. Haphazard. All Me. I am QUITE lazy. I love non-elaborate things and don’t like to make a song and dance about anything. I like my food to be flavorful and fast to cook. 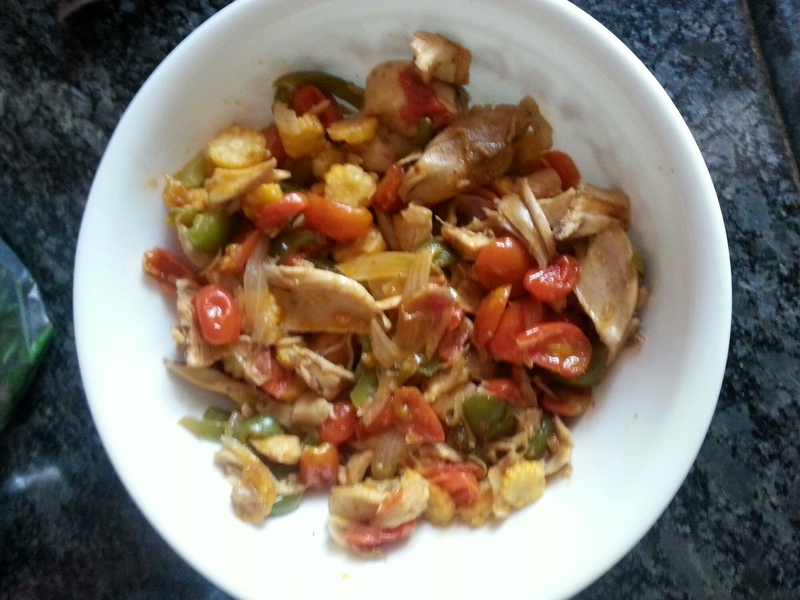 Am sharing a recipe for a chicken dish which can be used in wraps, with bread, rice or just hogged on cold. It’s not the most delicious thing you’ll ever eat but it’s a tasty dish which is fairly easy to make and the leftovers taste pretty good too so…making it almost aces in my book. Take boneless chicken pieces-200 to 300 gms. Dice up any veggies that go well with chicken. I used babycorn, capsicum and cherry tomatoes and onions. Microwave chicken on medium high for about 12-15 mins with a pinch of salt and enough water to half submerge the chicken if it’s already at room temperature else defrost it for 15 mins. Debone chicken and very lightly saute with 1-2 tablespoons of olive oil and gradually add the vegetables in once parts of the chicken start to brown. Add salt to taste and a pinch of paprika, ground pepper. Garlic powder is optional. Fry or reduce flame to simmer and cover and cook chicken and veggies fod 5-7 minutes. Suggested serving method- take a washed and dried lettuce leaf lightly dusted with pepper or garlic powder. Put chicken in the leaf and fold up like a pocket and secure with a toothpick if its not being eaten immediately. Else chomp down!